Cut Costs Without Missing Out! The holidays can be stressful, especially if you’re the one managing the budget. Between Thanksgiving and New Years there is no shortage of gifts, food, and drinks, to syphon bills from your wallet. But you don’t have to prevent yourself from enjoying this time with family and friends because you’re budget-conscious. If you’re trying to be fiscally responsible through the holidays, there are plenty of ways to cut back without missing out. Take Christmas dinner for example. By getting a little creative, and making meal-prep a team effort, you can save big without downsizing your favorite dishes. Follow the five steps below for ways to save money this holiday season, and for years to come. Start with your grocery list for ways to save money. Check out your farmer’s market for tasty ingredients that are in-season, yielding the most reasonable prices. Winter squash, sweet potatoes, and dark leafy greens are at their peak in the fall, all of which can be used in delicious side dishes. Trying to incorporate organic options without breaking the bank? Go organic where it counts, such as apples, carrots, spinach, and potatoes, which are some of the items most likely to be filled with pesticides. You’re also more likely to succeed in haggling prices at the farmers market stand than a traditional grocery store. Despite their alluring convenience, disposable plates and flatware just end up costing you. Plastic and paper options are not cheap, and they just end up in a landfill. If your kitchen collection is missing some flatware or serving platters, simply ask your guests to help out by bringing these special pieces. Then, have everyone pitch in to hand-wash their own plates and you’ll save on the electricity bill by reducing the number of times you run the dishwasher. When it comes to leftovers, use what you already have to store them. Use glass mason jars, empty butter containers, and other reusables instead of plastic containers and wrap. Single-time use containers are not a good investment for you or the environment. With the oven constantly running and extra bodies in your home, the temperature will naturally rise. This gives you the opportunity to save some dough by turning down the thermostat. You can even turn down some lights for a nice dinner ambiance, as well as provide a great post-dinner nap atmosphere. Set out some candles to provide a cozy ambiance and a little extra warmth. You may be surprised at home much home energy efficiency practices can save you. You can even go a step further, and save thousands of dollars every year by considering a solar power system for your home. You can see exactly how much you’ll save each year with our solar savings calculator. Fill out the short form below to speak with a solar installer in your area. Instead of stocking up on over-priced decorations from your local boutique, get creative. Just look outside for inspiration and keep it simple. Even if you don’t think you’re crafty, you can construct a beautiful centerpiece with natural materials from your own yard. 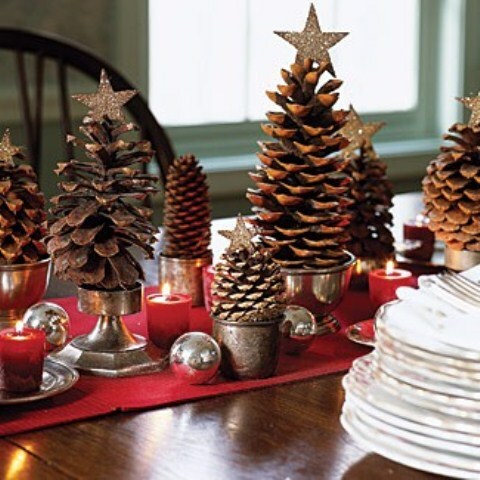 Stage some pinecones, autumn leaves, and candles for beautiful and rustic centerpieces. Then you also will have less to store after the big meal, simply return the décor where you found them! Don’t waste anything! Save all your scraps and be prepared with some delicious recipes to make the most of those leftovers. Need some inspiration? Try this turkey soup, and leftover stuffing recipes. Then you’ll have plenty to snack on through the weekend and maybe even some meals to freeze for weeks to come!